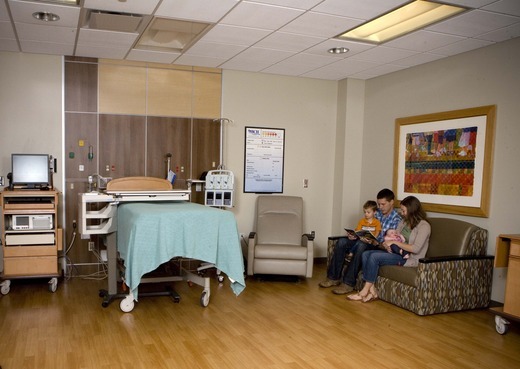 Our two Labor/Delivery/Recovery suites are located within the Maternity Unit and are attractively decorated with comfortable furnishings which offer safety, relaxation and privacy without disruptive room transfers. Each L&D suite has a whirlpool bath. A central fetal monitor system located at the main nurse’s station allows the nursing staff to observe at one station up to four women in labor. Nurses are able to monitor the well being of mother and child at all times during the labor process, not only within the room, but at the central station as well. If the doctor needs to be contacted, the system will allow the physician to view the fetal monitor strip from their office or home. For our patients who need to deliver via a cesarean delivery, the operating room is located nearby. In keeping with our philosophy of a family centered birth experience, we welcome your significant other to attend the delivery for a cesarean birth. We understand the importance of being close to your baby after delivery. Our mothers have the option of “rooming in” where their infant may stay in the mother’s room 24 hours a day. If you would like to rest or take a nap you can call your nurse to take your baby to the nursery which is staffed 24 hours a day with a nurse. The Maternity Unit is located behind closed doors on the west side of the hospital’s Patient Wing to provide a quiet, restful area for new parents. However, family and friends are welcome at any time to come into the Maternity Unit to visit. All babies are given an identification band and the numbers are matched to the mother's band whenever the baby is brought into the room. Our babies are also given security “beeps” that lock down the unit whenever they are brought close to any exit. If a door is tried to push open, alarms will sound.